Informing And Revealing To The Region. They looked thin, pale, weak and restless on their mother’s laps that afternoon at the Gurungu Health Center in the Wa West District of the Upper West Region. I had visited the community in search of evidence of malnutrition among children less than five years of age. Though unsure at the moment, the condition of the four, did not just hit me hard, but also gave me a strong feeling, that I was being confronted with hard evidence of what I set out looking for. Mr. Mumuni Abubakari, the In-Charge of Gurungu Health Center confirmed my suspicion and stressed that the issue of acute malnutrition was a common condition among children in communities around that area of the district. Nmwiepuo Dramani, one of the four young mothers had two children and both were suffering from severe acute malnutrition. Her husband left her and the two children three years ago in search of greener pastures but had since not returned. The poor uneducated young mother is unable to provide enough for the upkeep of her-self and the two children. She also lacked knowledge on the right food combination to provide nutritious meals out of the little she is able to provide. The rest of her colleagues are suffering from similar fate as it is a common practice for men in the area to abandon their families and travel to the South to engage in odd jobs. The unfortunate thing is that some of these men get married to different women and get settled there leaving their old wives back at home to struggle alone to cater for their children. Mr. Abubakari said sometimes out of sympathy, he and his colleagues in the facility sacrifice part of their own food to help these women. “Sometimes, we even give money from our own pocket to some of these women to buy food or even sit on a motor king to come to the facility; if not they will not come because they do not have money for transportation”, he added. 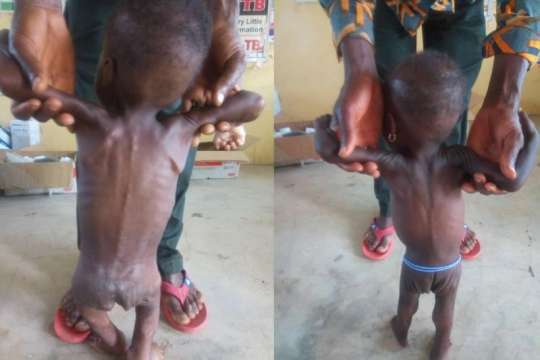 Mr. Iddrisu Issah, the Public Health Officer, said malnourished children were widespread in the district and that parents were not willing to even bring these children out for help. He said a house-to-house search in all communities was the most effective way to identify all these children for treatment. “We do not even have a single motor bike here; so how do we move to the communities to do the case search”, he emphasized. At Gurungu and surrounding communities, evidence abound that severe malnutrition is snuffing life out of innocent children in the district. At least, 20 children lost their lives between 2010 and 2017 due to acute malnutrition according to the District Nutrition Officer, Mr. Simon Asaman Awini. However, through the Community-Based Management of Acute Malnutrition (CMAM) programme, a total of 1,095 severely malnourished children have been saved. But, there were many other children still struggling with the condition that Mr. Awini referred to as the major killer among children aged, under five years in the district. Mr. Awini said malnourished children, apart from putting a burden on family income and the health system, also have their cognitive development affected resulting in poor educational performance. Survivors of malnutrition, he said, were at high risk of non-communicable diseases hence contributed less to productivity. He acknowledged the significant contribution of the CMAM programme to the fight against severe malnutrition in the district, noting that resources were vital to the effort at addressing the problem. Mr. Awini identified food insecurity as the topmost cause of malnutrition in the district. Referencing the 2012 Comprehensive Food Security and Vulnerability Analysis (CFSVA) report, he said food insecurity rate in the district was as high as 42 per cent, making the district the most severe food insecure district in the region. Low incomes, poor food combination, and low education levels of the farmers are the major factors adduced by the report to have accounted for the situation. The district Assembly through the support of its development partners is undertaking several interventions aimed at curbing the incidence of malnutrition which is manifested in stunting, wasting, under-weight among others. The current national policy that is supposed to address these challenges is the National Nutrition Policy (NNP). The policy has as part of its interventions nutrition-sensitive interventions, such as actions to increase food security, provide adequate health care, control and treat disease, improve hygiene and sanitation, increase education, and reduce poverty. These interventions are supported by relevant sectors to address underlying causes of under-nutrition. However, they appear not to have had full scale implementation at the local level including the Wa West. There still remained gaps that ought to be filled. It is in this light that the Netherlands Development Organization (SNV) designed the Voice for Change Partnership (V4CP) programme for Civil Society Organizations (CSOs) and the media to use the evidence generated to advocate for more policy adoption and support to address nutrition related issues, thereby contributing to achieving sustainable nutrition for all. Mr. Emmanuel WulloWullingdool, Policy Officer for the Ghana Trades and Livelihood Coalition (GTLC), one of the CSOs implementing the project in the Upper West Region, has warned that the high incidence of acute malnutrition among children less than five years in the Wa West could get worse if nothing was done about it. Speaking on the role of V4CP in addressing the problem of malnutrition in the district, he said since September 2016, conscious efforts had been made to let the assembly see the need to prioritize nutrition in their development interventions. “We observed the unfortunate death of a two year old child from severe malnutrition and then we understand it is a reflection of the situation in most deprived districts in Ghana”, he said. Therefore, under the V4CPartnershipprogramme, GTLC carried out a number of activities including engagement with the assembly as well as the regional level to help duty bearers to appreciate the need to put premium on nutrition in their development interventions. These, he noted, led to the capturing of Food and Nutrition Security as one of the development areas in the District Medium Term Development Plan (DMTDP). Setting up district nutrition committees, organization of community durbars and media engagements were done to create awareness for the community members to see the need to demand for improved nutrition services from the duty bearers. Mr. Wullingdool said they had also been engaging with Government, the private sector and relevant decentralized bodies to ensure they invested in good nutrition services delivery while ensuring that the nutrition policy became more gender sensitive and socially inclusive. He said in all these, they sought to achieve deepened political will to implement good nutrition policies, increased budgetary allocation to nutrition related activities in the district, effective collaboration and coordination among all relevant agencies to implement good nutrition policies and interventions. The GTLC Policy Officer, therefore, called on the government to as a matter of urgency increase its commitment by way of budgetary allocation to address the issue of malnutrition among children under five years. “Investing in nutrition is “smart economics” because studies have shown that for every US$1.00 invested in nutrition, there is a return of US$16.00”, he pointed out. Mr. Wullingdool observed that the current structure of nutrition from the national to the district level, did not allow for the effective coordination of nutrition related issues and suggested the setting up of a nutrition commission at the presidency. This, according to him, will ensure a high level political commitment in addressing the challenges associated with malnutrition in the country. Persistent food insecurity coupled with severe malnutrition has multiple effects on the attainment of a number of the Sustainable Development Goals (SDGs). Therefore, until government, private sector, civil society and the citizenry see the need to double their efforts by rallying behind the SNV V4C Partnership programme, malnutrition will continue to remain a threat to the lives of thousands of children and other vulnerable groups in the country. November 28, 2018 in Local News.